These charming Rustic Clay Jarritos or clay cups are excellent for hot or cold beverages. The natural porosity of the unglazed clay will keep the beverage temperature, hot or cold, for longer periods of time. The cup will sweat a bit when filed with cold beverages, but will not leak. The Rustic Clay Jarritos are equally attractive as a decoration for your table. They can be filled with snacks such as Pixy Stixs, cantaloupe and honey dew wedges, or even use it as a vase for flowers to adorn your table setting. 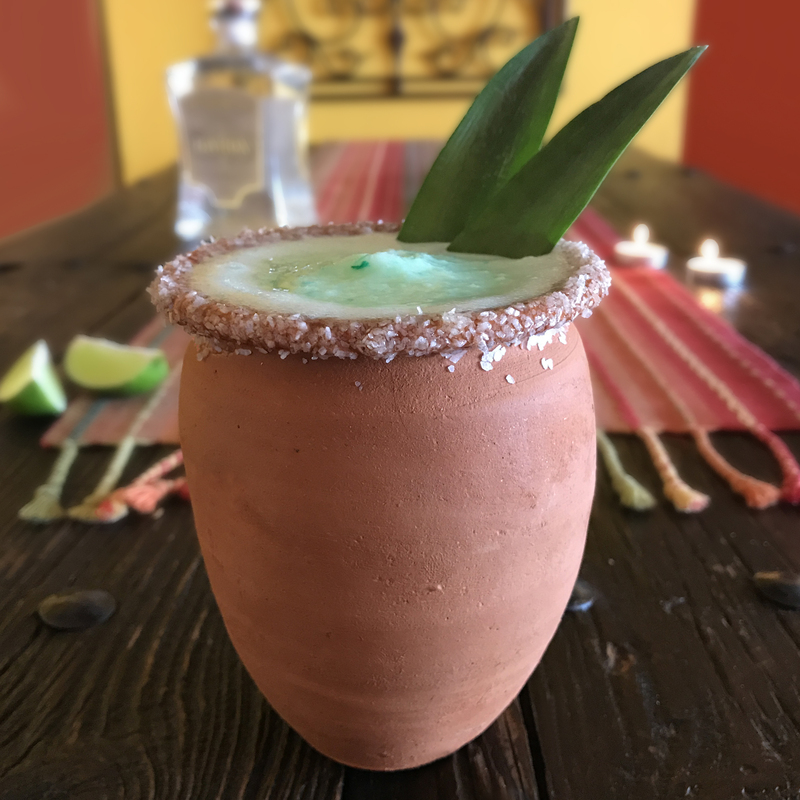 The Rustic Clay Jarritos are hand crafted by artisans in the semi-desert region of Hidalgo, Mexico, are unglazed and totally free of any toxic materials or lead and 100% Eco friendly. These Rustic Jarritos / clay cups are handmade by artisans in the traditional manner and as with most handmade products, the pieces may have slight imperfections in the form or finish of the materials. Sometimes sizes of same model pieces may also vary slightly, however, these imperfection do not compromise the aesthetics or functionality of the pieces and are considered normal and to be expected. The Jarritos are dishwasher safe, however it is better to hand-washed the pieces with mild soap, as putting them in a dishwasher can cause them to absorb the detergent flavor. Since they are raw porous clay, the jarritos should be boiled periodically using the same prodcure used to cure them (see curing tab) to make sure to disinfect the clay. Alternatively, you can run them through the dishwasher not using any soap so that the heat and hot water disinfects them. Never use metal or abrasive cleaners, and always try to avoid strongly scented soaps which can flavor the clay. Dry thoroughly with a soft towel. It is common for some staining or discoloration on the interior of the pieces to occur with use over time. Prior to their first use, the Rustic Jarritos should be boiled and allow them to cool down to room temperature. This can be accomplished be placing them in a pot, adding enough water to cover them and placing the pot on a stove at medium heat to bring to a boil. Lower to low heat once it begins to boil, and continue to boil for 15 to 20 minutes. Remove the pot from the heat and allow it to cool on it’s own to room temperature. Deep inside Mexico, in the semi-desert region in the Mexican state of Hidalgo, our cazuelas are made by hand by artisans whose craft has been handed down for several generations. Unlike their ancestors’ methods, today, the process has been changed for the better by glazing the cazuelas with lead-free glazes. The process begins by the unearthing of the clay from local quarries.The chunks of clay are then transported o the artisan’s compounds and spread out to dry thoroughly. Once dry, the chunks are ground with the help of an electric grinder, a modern day addition, until they are ground into a fine powder. The powder is then sieved to insure a uniform size, as well as eliminating any possible rocks or pebbles. The finely ground clay is combined with a little water and mixed by hand. The artisan continues adding water and kneading the mixture, much like a bread maker kneads bread. For the normally large batches this is done on the floor of their workshop. To make the clay cazuelas, the artisan takes a piece of clay sufficiently large for the intended piece, and pounds it to the thickness required by the piece with a tool much like a meat pounder made from lava rock, the same material as a Molcajete. The flattened clay is then molded over molds of the desired shape and size to ensure accurate reproduction of sizes. The piece is then rubbed by hand with water, and further rubbed with a wet lava stone to seal the pores of the clay. The clay is then turned over and out of the mold, and let to air dry. Once the clay begins to harden, the interior is smoothed with a wet sponge and rubbed with a small wet lava stone to seal the pores on the interior of the piece. The rubbing inside and out of the pieces is a time consuming and laborious task, but results in excellent quality cazuelas, unlike some others rustically made which are available. The next step of the process is the putting of the handles. To do so, the artisan begins by rolling a piece of clay forming a rod shaped piece. The rod is then slowly flattened on the work bench using the palms. Dipping the rod in water to make it slippery, the artisan then holds the flattened rod with one hand he uses his other hand to run his thumb downward along the flattened rod to shape the handle the desired contour and making ridges. He then snips off a length to trim the handle to the required length. Once the handle is shaped, he attaches the handle to the piece smoothing the joint between the two pieces of clay making the joint invisible. Once fully dry, the now dry and brittle pieces are sanded inside and out with porous lava rocks to ensure a smooth finish, and leaving them ready for the first firing. The first firing is done in a dome shaped wood burning over for over three hours. The pieces are stacked one on top of another in the upper chamber of the oven, while a hard wood fire is lit in the bottom chamber eventually reaching temperatures of over 1,000 degrees Fahrenheit. After the firing, the cooled pieces are then glazed. Our products are glazed with 100% lead free glazes which are arduously mixed slowly by hand so as to not introduce bubbles. To glaze the pieces, the artisan carefully dips the entire pieces in the glaze, letting the excess drip away. For larger pieces, the glaze is splashed on and let drip off. The glaze immediately begins to dry and become opaque. Once semi-dry, the bottom is scraped with a hard plastic tool to remove the glaze from the bottom which can cause the piece to stick to the kiln in the second firing. The bottom is then cleaned with a wet sponge. Once the glaze is fully dry, the piece is then ready for the second firing. The second firing is done in a modern gas kiln to better control the temperature and conditions. If during the second firing, the temperature is too low, the glaze will not mature or become transparent, and if too high, it will become too melted and actually run off the piece. The pieces are then fired at between 950 to 1,000 degrees Fahrenheit and result in the beautiful Mexcian Clay Cazuelas we offer. After experiencing the entire process, which all told can take anywhere from 15 to 20 days from extracting the clay to the finished product, we have gained an appreciation for the artisans craft and a greater respect for their work.